Get the root permissions of LG phone allows you to access the heart of the phone, so you can perform a series of advanced operations such as deleting stock apps. Virtually all LG phones are sold without these permits because the possibility of damage, having full access to the phone itself, is potentially very high. However with the growing interest of installing modified ROM, and an ever increasing spread of apps that need root access, leads us today to focus on rooting when you got an Android phone. There are some really good reasons to root your LG phone. The simplest reason is that rooting your LG phone will allow some cool features that probably not enabled by default, such as advanced application firewall or install custom ROMs etc. In addition, rooted LG phones can take advantage of some great performance tweaks, such as CPU overclocking and improved cache management - that can dramatically speed your device. Rootable LG Device: LG G5/G5 SE, LG G4/G3/G2, LG V10/K10/K7/K4, LG G Stylo/Stylus/Flex and many others. The app we will discuss in this tutorial is call Android Root Pro. This program captures almost all branded phones and you should check whether Android Root Pro is compatible with your device. You can go to official site of Android Root Pro and check between brands and models. Download the program and install the Android Root Pro program on your computer and connect your device to your PC via the USB cable for the root process. You can take all advantages of these options in just one click. Android Root Pro is a great program with higher success rate. Therefore, Android Root Pro is an ideal solution, which will give you root access to your LG phone in just one click. But you have to know something before you root your LG phone. 1. If you don't want to lose your phone data, it is better to backup you LG phone first. 2. Have a look that your LG phone should have at least 25% charge. 3. Please enable USB debugging mode or your device will not be detected. 4. You will not get an official warranty if you root you LG phone. Step 1: You have to download Android Root Pro from this site and install it to your computer. Step 2: Launch the Android Root Pro program and connect your LG phone via USB cable with USB debugging mode activated. Step 3: If your device detected, then just press "Root Now" button on the program and wait till the process finished where you will get a pop-up message. When you get the message that your process is finished, then you are done, now you can install custom Rom, remove bloatware, or manage your phone memory in advance mode. However, if you switch your phone with Android Root Pro you can root other brands as well such as HTC, Samsung, Sony, Huawei, etc. 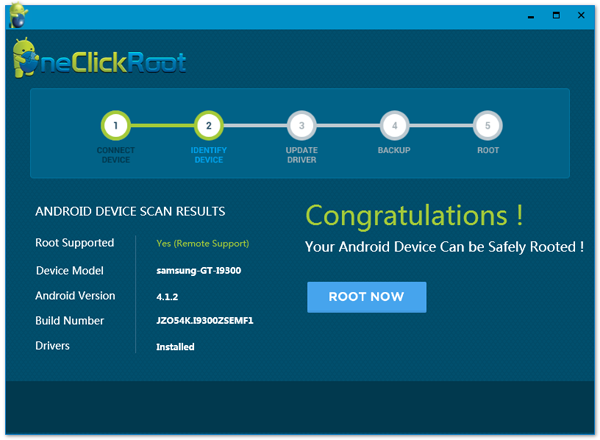 Android Root Pro is a premium quality program but it's free to download, you should use this program to root your phone in just one click, the easiest rooting app that I can think of.